Saw Gibbs 1903-A4 sniper repro at the NRA show, watched the informative video review and decided I wanted to play with it. The rifle that showed up looks great, has very nice wood and comes with a really neat scope. It looks like a 1940s optic but it’s clarity is on part with the best of modern glass. 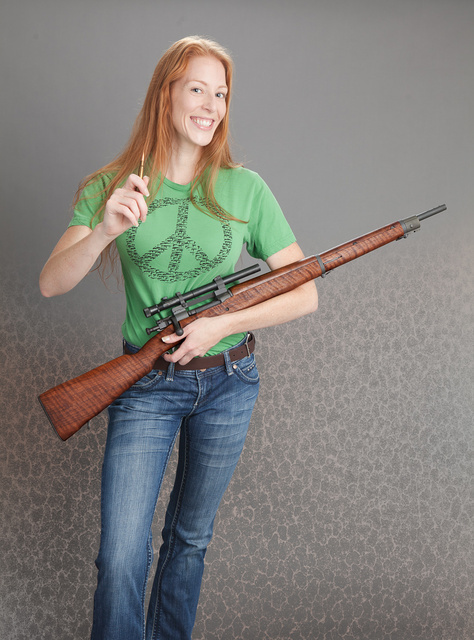 This entry was posted in rifle and tagged 30-06, green, peace, redhead, reproduction, smile, sniper, Springfield, tshirt, woman. Bookmark the permalink. 10 Responses to Peace, love and tight groups. I shot my smallest group ever with a custom .30-06 built upon a ’03-A3 action. 5 shots from a bench, 100 yards, .298 center to center. The barrel is a 24″ Douglas, it’s fitted with a Timney trigger, bedded in devcon to an old Remington 40X stock and topped with a Leupold 3.5-10X 50mm Adjustible Objective glass. Another quality WV product! See, we don’t just produce stereotypical people, we also supply with world with great shooters! Damn. Just when I got over my current case of gun lust……. Daddy wants! I believe in love,peace & large caliber firearms. Ahhh, yes. Peace through superior firepower!!! I’ll be damned, a Gibbs (used to call them “Fibbs”) 1903A4gery! There’s a gun in that picture? I don’t know which one I’m liking more, the gun or the girl!? I’ll go with the girl. Please show more of her! Pretty redheads are a bonus.